A new initiative, led by Asif Shibgat Bhuiyan. Upon being asked by a friend whether I had read Kaushik Basu’s recent piece on Bangladesh, my first reaction was — is that the rather lazy piece on why Bangladesh is doing well? Let me note my gratitude to the friend for pushing me to read the piece. It is, to use the favourite adjective of Bangladesh’s Finance Minister, just bogus. Out of respect for my personal interactions with the author, I will refrain from using that term. But this bizarre article should still be debunked. As I read about the 19th Congress of the Chinese Communist Party, it occurred to me that throughout my professional career, for some reason or other, I have had to think about the consequences of a hard landing in the Chinese economy. It also occurs to me that I first started thinking about Bangladesh towards the end of graduate school — that is, I first fretted about an economic crisis in our People’s Republic before I ever thought about the other one. Then I remembered this cautionary note about China (and India), which apply just as well to Bangladesh. In its just released World Economic Outlook, the IMF forecasts Bangladesh economy to grow by 7% a year over the next few years. It has been a while since I looked at the detailed data, so I am not in a position to comment on whether the IMF is too optimistic. Look at the chart below, and think about whether 7% growth would be too optimistic? Rotate between three big buckets: politics/history, pop culture, and economics. When writing about the first topic, make sure it won’t sound ridiculous in six months. And avoid talking about people and focus more on theory and data. My friend reminded me of this passage from a three-decade old paper on economic growth. The consequences for human welfare involved in questions like these are simply staggering: Once one starts to think about them, it is hard to think about anything else. I wonder what Nancy Stokey feels about that! My partner will for sure not be happy if I spend all my time thinking about economics. But when not thinking about strange stuff, it is indeed harder to come up with a bigger question than why some societies have so much higher living standards than others. List 10 books that have stayed with you in some way. Don’t take more than a few minutes and do not think too hard. They do not have to be the great works of literature, just the ones that have affected you in some way. Tag 10 friends and me so I can see your list. Over the fold, for archival purposes, are two lists — one general, the other economics related. ….. because life got in the way. Okay, that’s a bit melodramatic. Let’s start again. It used to be the case that to have a professional career as an economist in America, you needed a PhD. That’s changing a lot. There’s a general glut of PhDs. And organisations such as the IMF are now more interested in people with practical experiences than half a decade or more of often impractical academic training. In any case, outside America, PhDs were always for those who wanted to pursue an academic career. So, other than the vanity of being addressed as Dr Rahman, I’ve never really seen much return from doing a PhD. And yet, every now and then, I think about the ideas over the fold and wonder what might have been. Like much else, Bangladeshi discourse about madrassas usually shed more heat than light, revealing the biases and attitudes of the so-called experts who see in madrassa teachers and students either footsoldiers of terror or the vanguard of the coming revolution. Niaz Asadullah, a British-trained development economist is a rare exception. With his longtime collaborator Nazmul Chaudhury of the World Bank, he has published a series of papers on the subject. I’d encourage the interested reader to follow up from Dr Asadullah’s page. Over the fold, let me hightlight this paper. Like a match box full of sticks —that’s how the Farmgate over bridge was once described to me. It was the early 1990s, when six or so million people lived in Dhaka, while Bangladesh’s population was around 110 million. I can’t think of any match box that, once full, can pack in a significant rise in the number of sticks, and yet, Bangladesh has somehow found room for extra people. In the two decades since my visiting friend saw the teeming multitudes of Farmgate, the country’s population has risen to 150 million, and depending on how one counts, Dhaka is home to 15 or more million people. 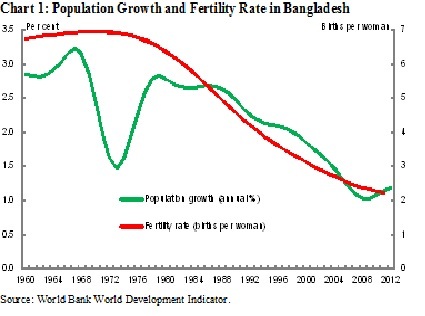 The headcount, however, does not quite capture the fact that Bangladesh is going through a demographic transition. A transition that is perhaps as remarkable as, and probably related to the Bangladesh paradox. As Chart 1 shows, over the past three decades, population growth has slowed significantly and the fertility rate (the number of children each woman bears on average) has declined markably. Given the fertility rate is already close to the replacement rate of around 2%, it is quite possible that population growth may well slow even further from current 1% a year.